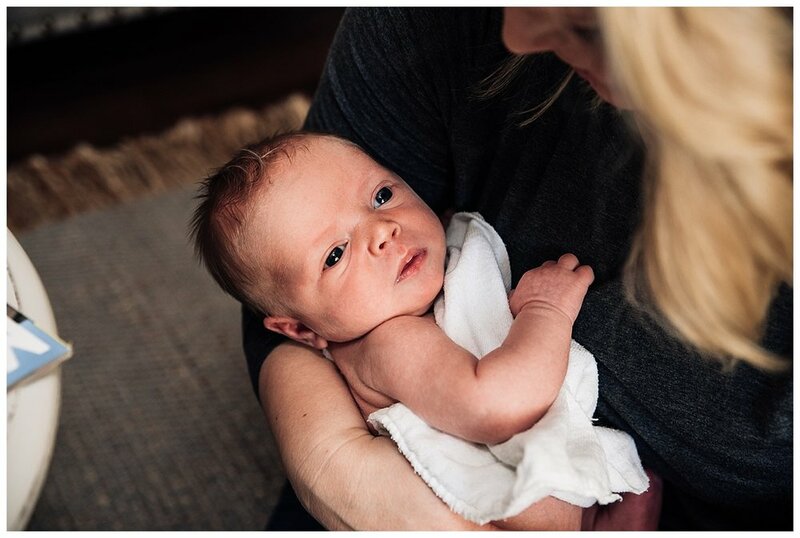 I offer three types of newborn sessions: Fresh 48, Studio, and Storytelling. If I was asked to pick a favorite, I don’t think I could, but today I want to tell you the reasons why you NEED a Fresh 48. 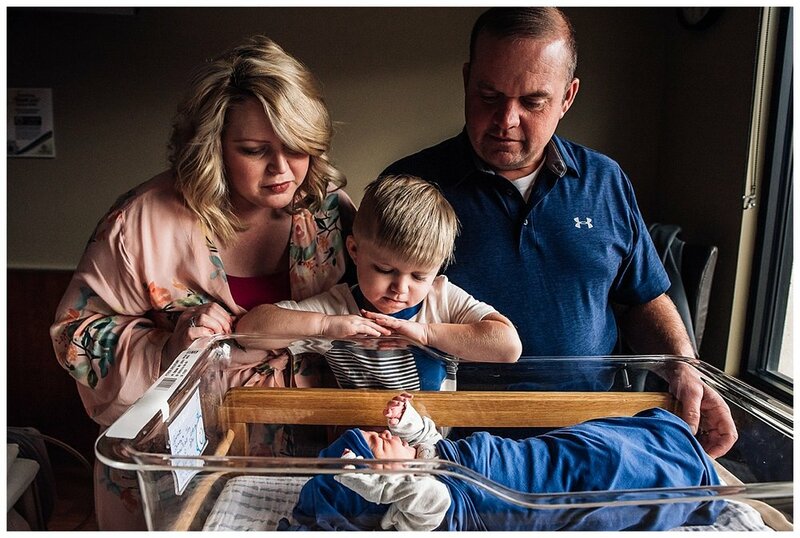 I never had any newborn photos done with any of my kids, but if I could go back, a Fresh 48 would be the first one I would pick. You have a new baby! A new baby. Can you believe it? You spent 9 months growing this little person inside you and she is finally here. What better way to remember the first few days? The time in the hospital is like no other time…it is almost like time stands still. 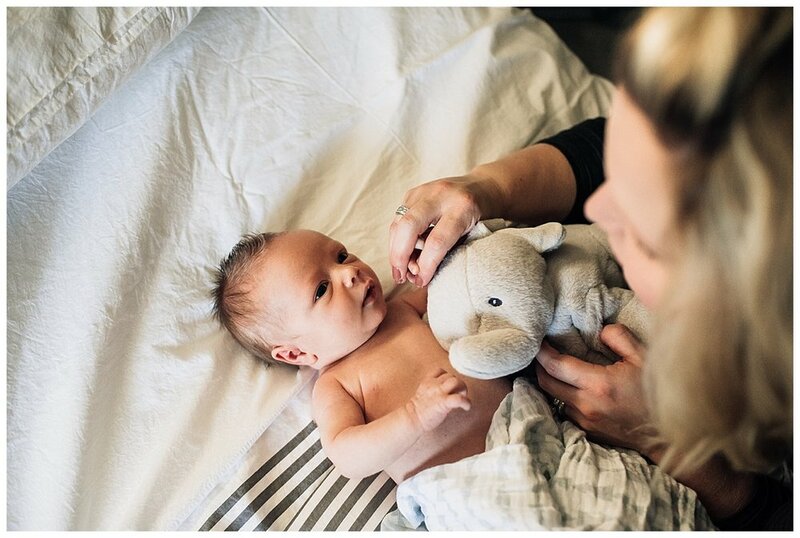 All you have to focus on is your new little one: getting to know him, smelling the fresh baby smell, introducing her to family. You don’t have to worry about how clean the house is. It’s a hospital room that you don’t have to clean or worry about it being perfect. I’ll move whatever I need to while you sit back and relax. I come to you; no worries about getting the entire family packed up and out of the house on time. It’s very casual, come as you are…no coordinating outfits, no spending hours on your hair. Baby photographs best in a white onesie, and often the hospital provides that! For mom, wear a pretty robe or yoga pants and a cardigan! A baby changes so quickly. 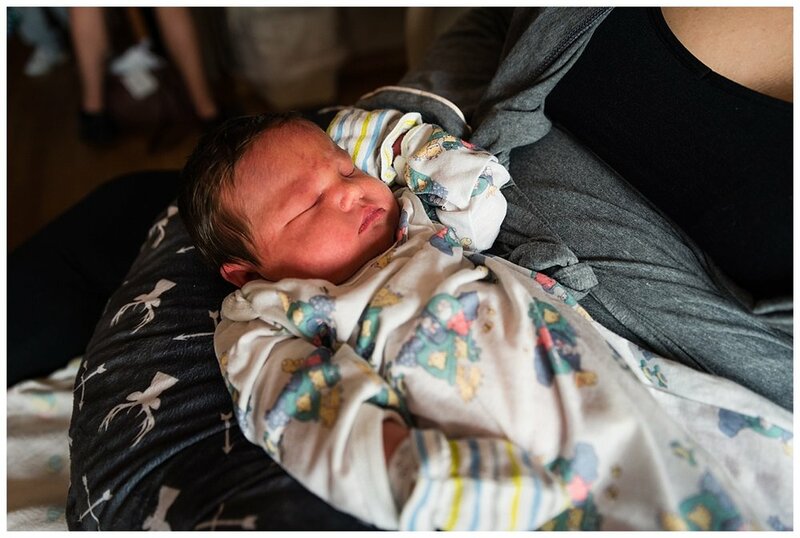 Newborns are wrinkly and scrunchy and spastic and sleepy. Even a couple of weeks later, their looks are different. You probably won’t be up for taking lots of photos of your baby yourself. 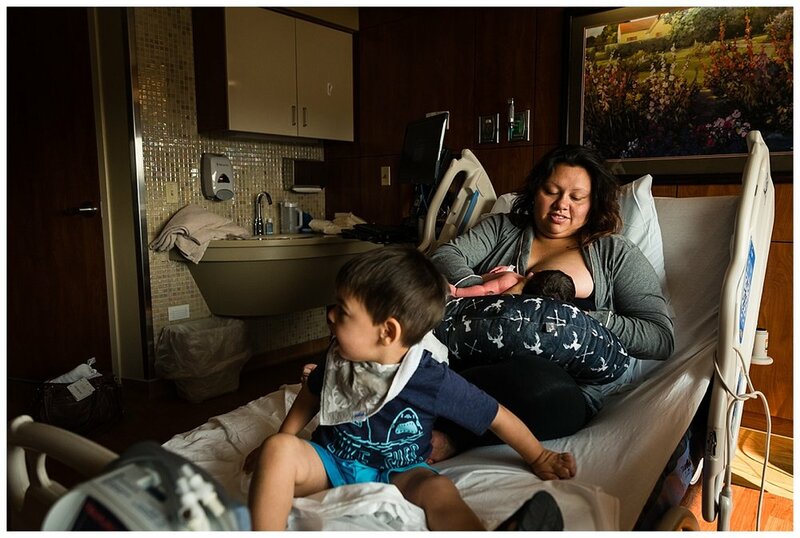 You’re learning how to breastfeed, figuring out how to move so you don’t hurt, entertaining all the family who comes to see you, snuggling your baby, and keeping your toddler from poking the baby’s eyes out. That doesn’t leave much time for setting up or styling photos. Hospitals can actually have good light. I love the coziness and the moodiness of the light in the room. 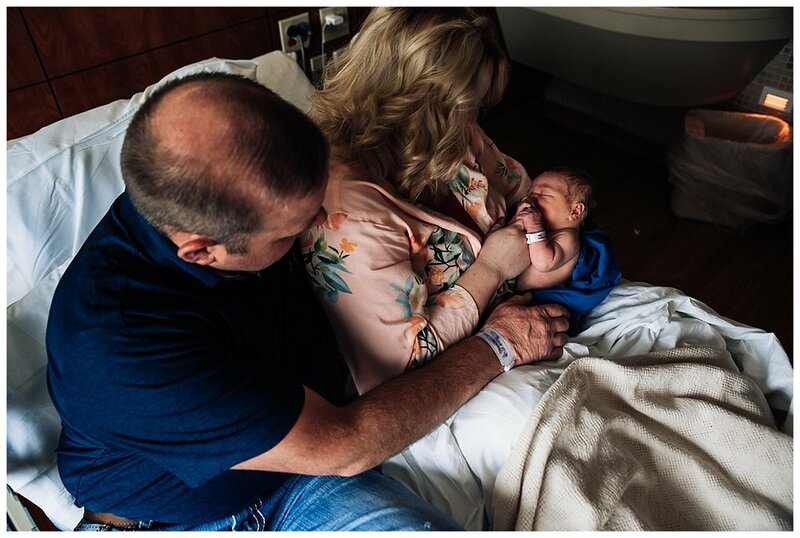 My photos are all about connection: between you and the baby, between you and your spouse, between the baby and your older kids, between grandma and the baby, etc. I use light to shape those connections and focus on what’s important. I do video. Those newborn cries are SO precious. The belly breathing. The yawns. The little hands waving around. A tiny finger wrapped around mom’s finger while feeding. These are all things that are amazing to watch later (especially when your baby is now two years old and testing your patience at every moment of the day!). This is a priceless time. Never again will you have nothing else to do but focus on your relationship with your baby. Remember this time with photographs! To book a Fresh 48, click more info at the top and fill out the contact form! I would love to hear from you and make your Fresh 48 session amazing! Harvest was like the longest ever this year, but at the same time it didn’t really feel like it. We had so much rain and snow that we didn’t even have a full week of harvest until November. There were times that I actually wished that Curtis could get back into the field! 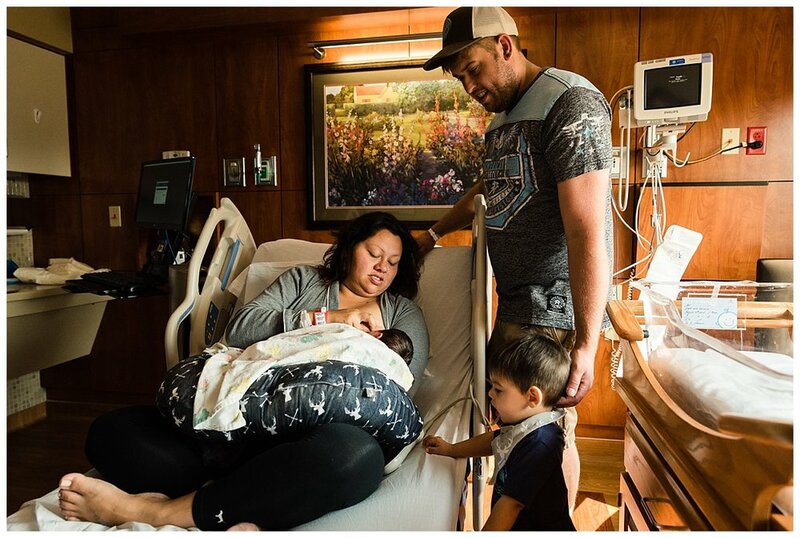 But luckily for the Jones family, it rained at the right time so that Tony was able to hang out in the hospital when their baby was born! Jamey was gorgeous as always, and so excited to have a new little brother for their 4 year old. It was a rainy and dark day, but oh goodness, I just loved the light in that hospital room. It seemed so cozy and wonderful and right. Baby Gavin was adorable! 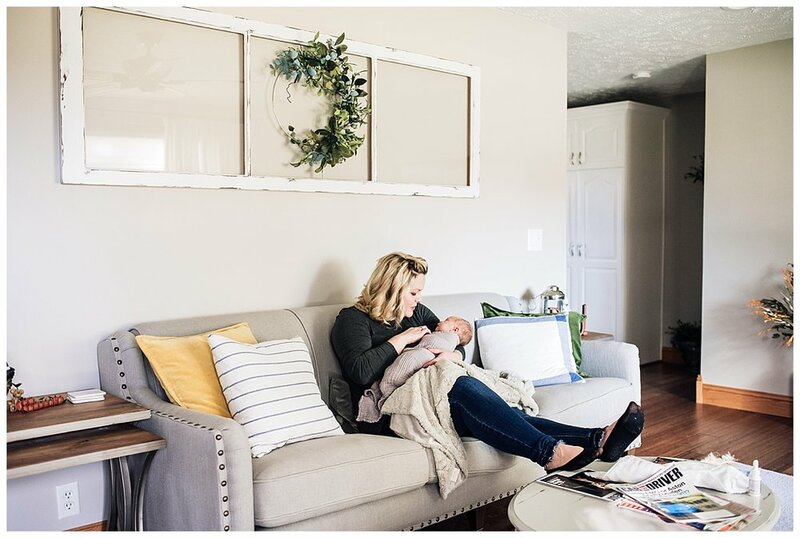 A couple of weeks later, I went to their house to capture life with baby Gavin. He was a DREAM! I first met Matt and Aurelia last year when I did their fall family portraits. They were the best and had the sweetest little boy! 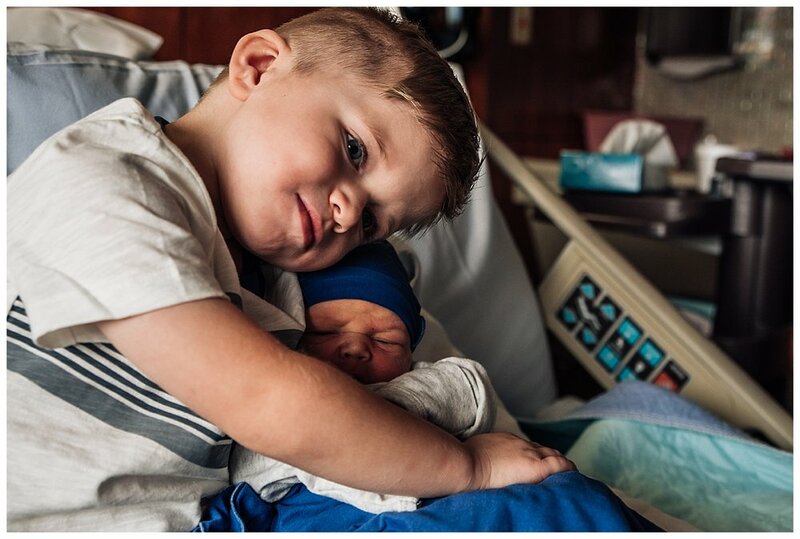 This year, they added another little boy to their family. 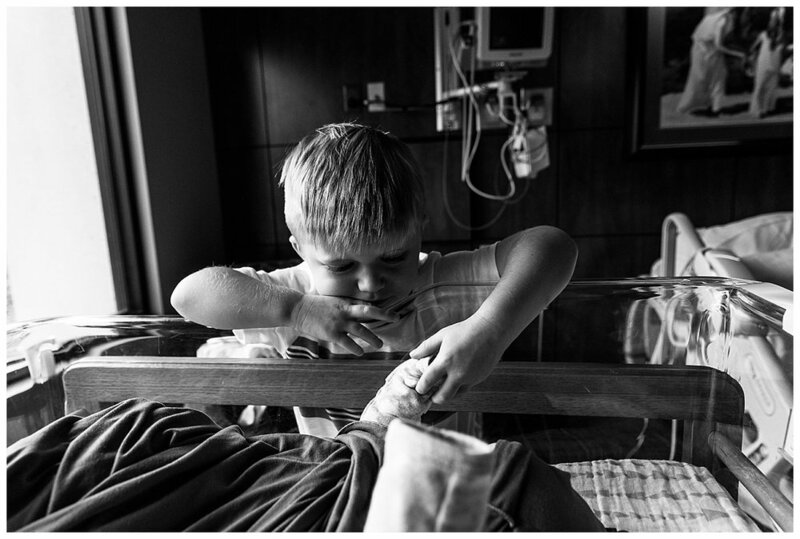 I loved spending time with them in their hospital room and capturing all the details of fresh newborn life. 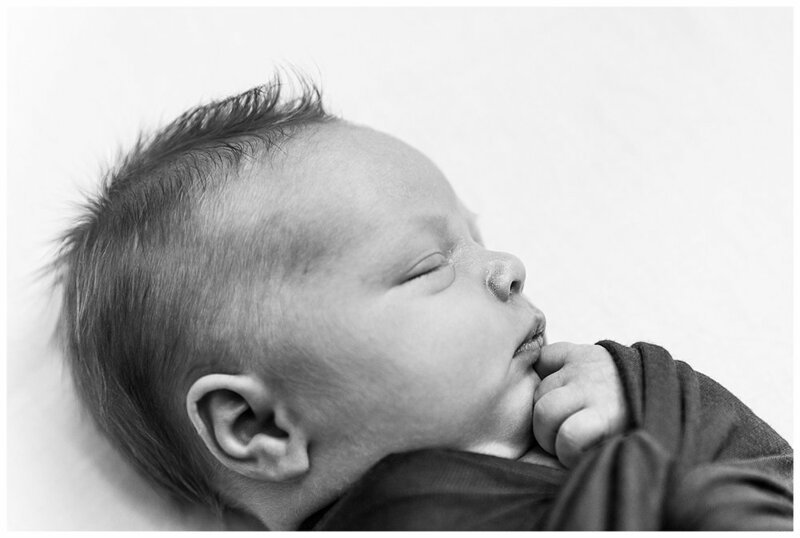 Their new little one was ADORABLE - I mean, look at those cheeks! As anyone with a 2 year old knows, they don't always want to cooperate. This day was no exception - but I loved how Aurelia and Matt just let him be. 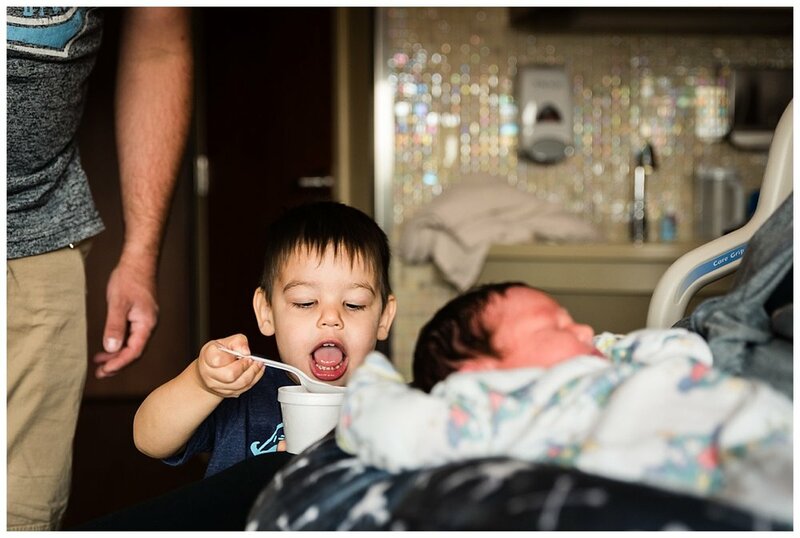 It's totally real life - of course he's going to be more interested in ice cream than his new baby brother! Someday when the family looks back on these, they won't remember the stress of trying to get him to do what they think he should do. They'll remember how it felt to watch your toddler do all the "big boy" things while thinking he looks huge all of a sudden and this newborn is so tiny and was my toddler ever this small? Just 15 months ago, I did my first Fresh 48 ever when Mark and Marilee's boy Kinnick was born. They asked me back again for the birth of their second baby. 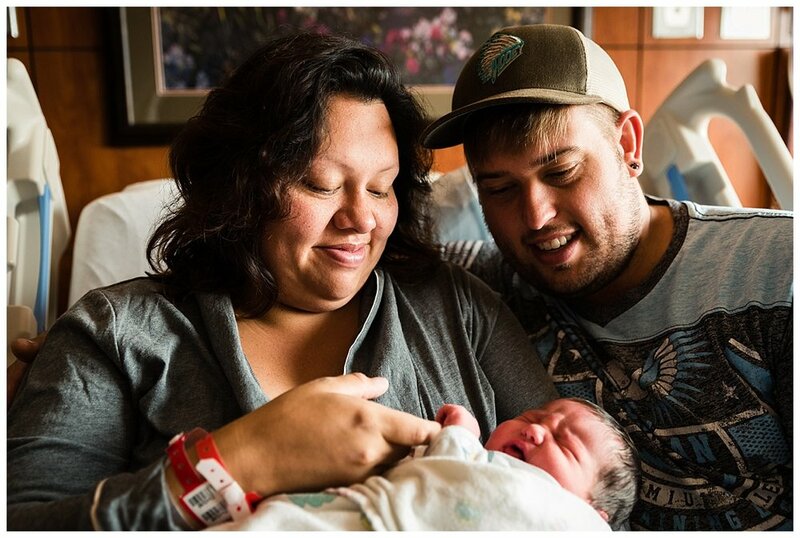 Again, they didn't know what the gender of their baby was, so I was there to capture the birth of little Hendrix. 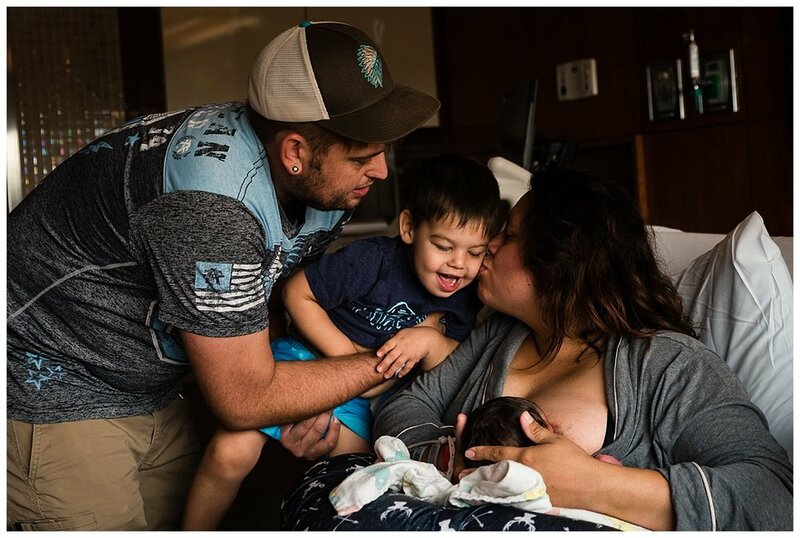 The next day, I went back to the hospital to take photos of this sweet growing family! Kinnick was so sweet with his baby brother (but what is it about toddlers wanting to poke baby eyes?? Mine all did the same thing!). I cry every time. Every newborn video that I put together makes me cry. It's something about the combination of music and little newborn gestures and it being 5 years since my baby was tiny. Flynn was born back in September and between the busy fall and holiday seasons I didn't work on his video until this month. 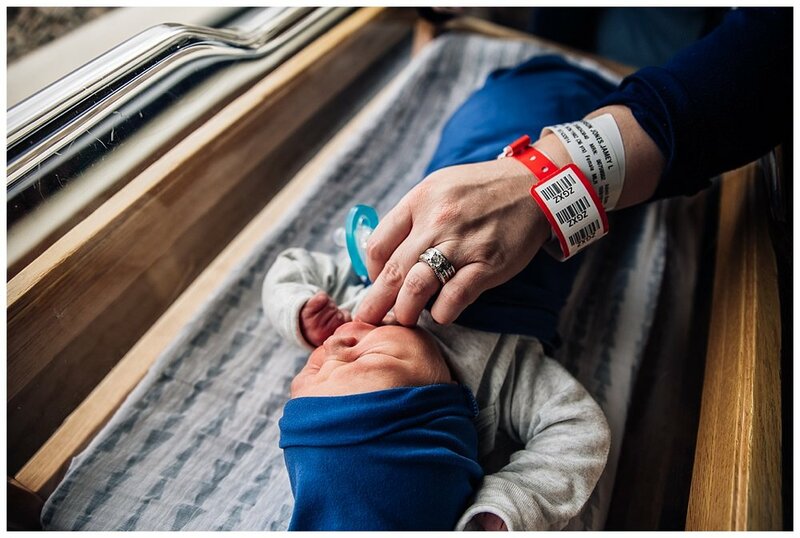 I think now I'm going to wait four months for every newborn video because theres's something special about seeing how tiny a newborn is compared to how big a four month old is. I got the sweetest text from my friend after she saw the video...and I love that I made her cry, because that means I'm not the only over-emotional one around here. 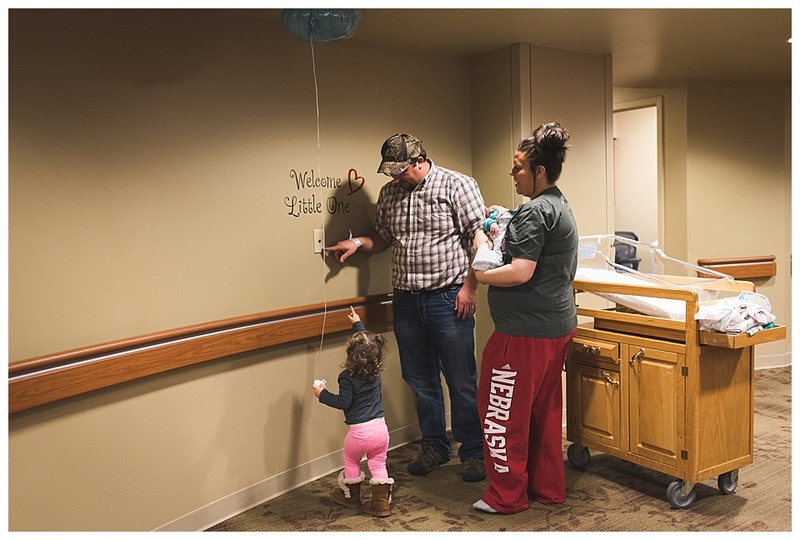 This new baby is going to be loved by her two big sisters! Tori's oldest sister just could not get enough of her - it was so cute the way she constantly wanted to hold her, touch her, and just be near her. The middle sister wasn't too sure about Tori...but eventually she wanted to join in the fun too! I just love how big their smiles are. Congratulations, Danielle and Austin...your household is going to be so fun with everything princesses, kittens, pink and sparkly! 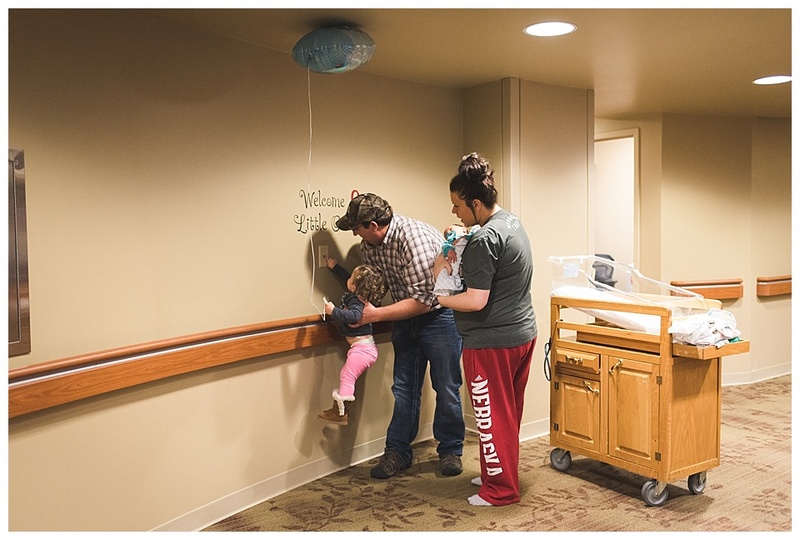 I feel so lucky to have documented Jenny's pregnancy from the gender reveal to the newborn days in the hospital! If you haven't seen how Cody and Jenny revealed the gender of their second child - go check it out here first. One of the reasons why I love unposed photography with kids is because you never really know what is going to happen! 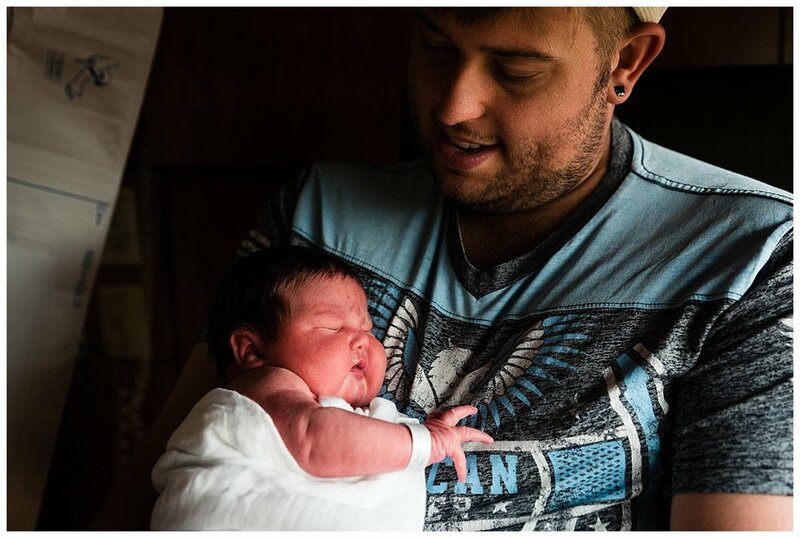 Even with a newborn, it can be a bit unpredictable - will he cry? Sleep? Look around his world calmly? Chance did all of that, but my favorite part was when he got to hang out with big sister Kendall on the bed. Kendall is not even two, but I can tell that she is going to be a great big sister! Chance is going to love her and I'm sure that the two of them are going to keep their parents busy during the next few years.